Minerals, Rockhounding, Botany, Herbalism, History, Hiking, Exploring Historic Sites & Ancient Ruins, Studying Art, Craft Practices & Indigenous Cultures across the globe. Born in Seattle but raised predominantly in the Southwest. SFF: Where are you from and how did you decide to move to Santa Fe? PB: Although I was born in Seattle, I have moved often throughout my life. I would consider the most memorable years of my childhood to have been spent in Arizona and New Mexico. The desert became my playground, my teacher, my inspiration. I eagerly studied the botany of the desert at a very young age, finding myself especially drawn to those plants that were known to have medicinal, utilitarian, or craft applications. Through my grandparents, who were avid rockhounds, I came to love the gems and minerals that are so abundant and diverse here. Both my Mom and Grandparents were docents at various National Monuments and Parks; hot afternoons spent exploring the sun-baked ruins of ancient Ancestral Pueblo settlements as a boy sparked my lifelong interest in the history and legacy of the Indigenous populations of the Southwest. When I moved away, I carried these deep imprints with me in my heart, and instinctively felt that I would return when the alignment was right. SFF: How would you describe your craft/business? PB: I would say that both my craft and business are natural extensions of who I am, how I see and move in the world. As I mentioned earlier, the geography, culture and history of the Southwest made a deep imprint on me as a child compelling me to engage creatively within the visual language of that historic legacy from a place of deep admiration and respect. So in Field Studies Editions I have found what feels like an authentic and still very personal way to share that inspiration with a larger audience. The physical manifestation of my work on a day to day basis involves the production of fine art print editions based on my own original artwork: paintings, photography, and altered imagery from antique, out-of-print sources. A typical day at FSE could involve a wide range of processes from print production, fabrication of my jewelry line, development of design & display elements, as well as styling and photography of all of the above. SFF: Describe your artistic/professional journey of how you got to where you are today. PB: Well, I’ve always been a maker, and I’m also a collector — that can be a dangerous combination! I had the great fortune to work in museums for many years, though, so I quickly learned the importance of curation: focusing collections and displaying them in a way that tells a cohesive and compelling story. One of my earliest projects integrated an extensive personal collection of medical and pharmaceutical antiques into an immersive museum environment that told the story of the development of institutional medicine in the US. I was attending The School of the Art Institute of Chicago at the time. I graduated and moved to New York City in 2003 where I was very fortunate to become involved with fabrication and installation of window displays and interior decor for Bergdorf Goodman. It was an exciting time for me as a young artist in the city, stepping into a legacy established by art-heroes Andy Warhol, Robert Rauschenberg, and Jasper Johns. It was a great introduction to the ways that exhibition design translates into a fashion and commercial context. That journey continued when I was approached by Coach Leatherware to prototype, design, and coordinate product display and decor in their flagship stores worldwide. These experiences and the incredible artists and minds I worked with during my time in New York shaped me profoundly; I became adept at creating very polished interiors and high-end tableaus, and that skill continues to inform my practice in a number of ways today. I especially love the challenge of taking objects and images that feel personal and meaningful to me and elevating the way they are displayed and perceived. I want my art to convey this sensibility... to take imagery, for instance, that reflects the “Southwest” without falling into tired conventions of how that aesthetic may have manifest in the dominant art & design dialogues of Santa Fe in the 1980s. A pair of old cowboy boots and an image of a howling coyote set against a maroon accent wall doesn’t feel fresh anymore, but that doesn't mean there aren't a million other exciting, regionally inspired visual combinations that can reflect a more contemporary and specifically Southwest perspective. Field Studies Editions is all about playing within that space! 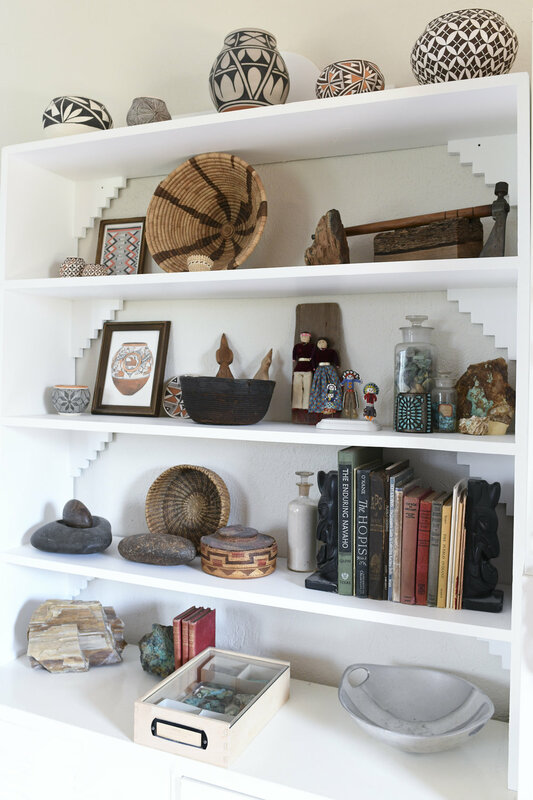 Alexander Girard is such a huge inspiration in the way he integrated modern furnishings, a clean, pared-down aesthetic, and beautiful examples of regional crafts within the Pueblo-style architecture of Santa Fe. Georgia O’Keeffe did the same so elegantly within her Abiquiu home. Shiprock is getting it right in every way possible... so inspiring! The El Rey and La Reina... Swoon! But I digress... haha. At a certain point I sold off my medical antiques and began collecting examples of Native American artifacts and art in hopes of one day creating another museum installation focusing on the evolution of Indigenous art forms, ideally in a way that narrows the dissonance between the maker and viewer. This then reawakened the magic and wonder that I experienced growing up immersed in the Ancestral Pueblo culture of New Mexico, and I felt the call to return. At the time I was in Los Angeles, running print production for a fancy fine art print house that served interior decorators, film set decorators, and so forth. I was astonished at the demand for well made, affordable, and aesthetically appealing decorative art, and since I was already making small paintings that would translate well into print editions, it seemed natural to start my own print studio! I did so, first with a couple friends while in LA and we were very successful, but my heart wanted to be in New Mexico and my work very much reflected that. At long last, a little over a year ago I made the lead back to Santa Fe and immediately threw myself into the creation of Field Studies Editions. After a long and winding journey, I have to say there are not enough words to describe how gratifying it is to be home. SFF: What's your favorite thing about what you do? PB: I have reached a point where work is truly pleasure! What I do through FSE sincerely encompasses all of my interests and I love sharing my creativity with others who appreciate what I do. It has been really fun connecting with other people in Santa Fe who recognize the magic and potential of this place, and who are excited to share with others all that is beautiful about New Mexico. I’ve been especially inspired by the passion with which Jay and Alison Carroll have tackled the renovation, design and rebranding of the historic El Rey Court, a local gem that was aching to be reinvigorated and reintroduced to Santa Fe and the world beyond. I’m so honored that they chose to showcase my artwork in their rooms; seeing the prints live within their vision refreshes my sense of how the work can continually redefine itself through the eye and experience of each new guest. SFF: What's the most challenging thing about your work? events at the local Pueblos, to spectacular hiking destinations, not to mention that Santa Fe is one of the most romantic places in the world; there is always something to do or explore which can make focusing on work a challenge sometimes! Fortunately I draw so much inspiration from all of the distractions that I can always justify stepping out of the studio for a bit. SFF: What is your favorite thing about Santa Fe? PB: My favorite thing, without question, is our city’s proximity to so many of the Pueblos which are, themselves, at the very heart of what I find so beautiful and compelling about this place. We are living in the midst of a truly ancient culture which has maintained its ancestral lands, heritage and traditions in spite of centuries of outside influence and aggressive change. Despite a shared ancestry, each of the 19 Pueblos is so unique, and although they share common forms of artistic expression, many are also uniquely identified with specific art forms—jewelry, styles of pottery, weaving, etc. I love visiting the Pueblos during Feast Days and have become friends with many artists from the different Pueblos. Feast Days are a really special time to re-connect and support their work. 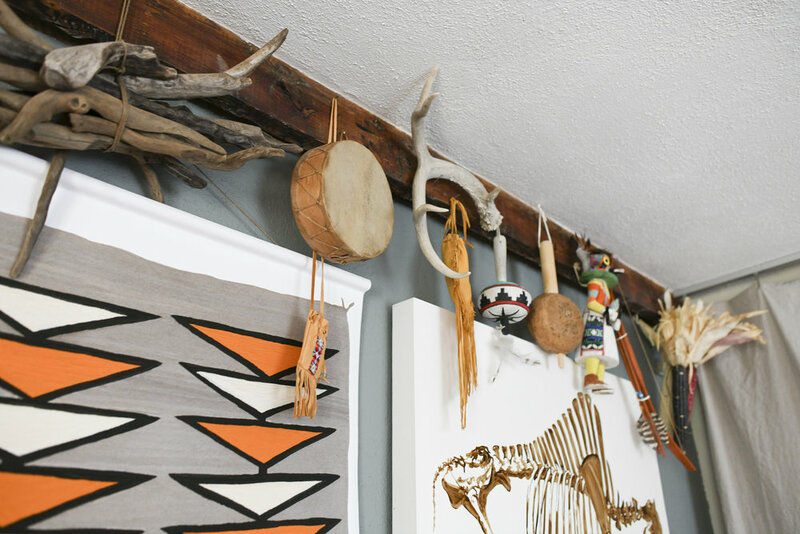 Pueblo culture and it’s aesthetics are so tightly woven into the fabric of Santa Fe; attending Feast Days and celebrating the artists is such a beautiful way to feel closer to the original magic of this place we call home. SFF: What are you passionate about outside of your business? 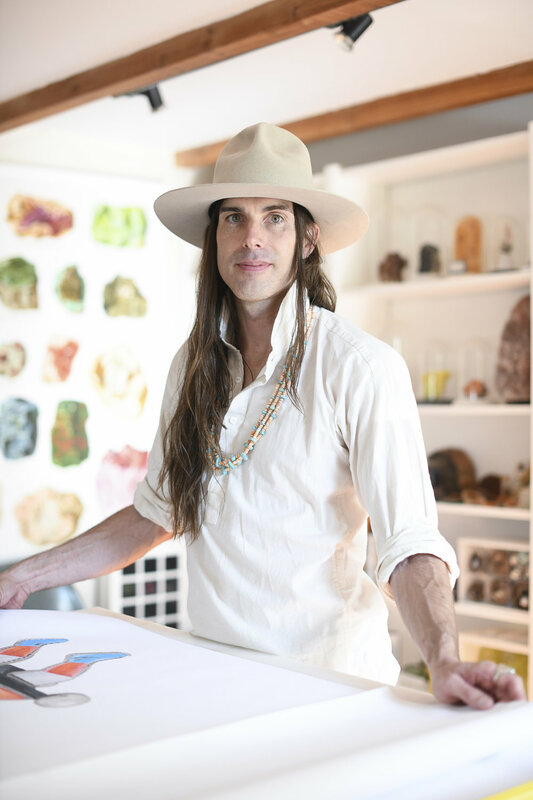 PB: My time spent rambling and adventuring in the canyons and mesas of the Southwest as a child sparked a lifelong passion for the gem and mineral world, which recently manifest in my jewelry line. New Mexico is a rockhound’s paradise; the geologic diversity constantly surprises and delights me. The more I explore the desert’s mysteries the more it seems to contain. From pre-historic oceans to spire-studded desert cathedrals, this land has seen an awe inspiring spectrum of change. In the face of the unknowns, the constant flux, and the call to adapt in our own lives, I find that the stones are comforting reminders of the beauty and refinement that time reveals. One place that I find especially inspiring is the old Mica mines in the hills behind Ojo Caliente. Anyone who goes to soak in the springs should treat themselves to a sunset hike to the mines just up the hill from the spa... the easy hike is marked by small sparkly sheets of Mica scattered along the trail that become ever more abundant as you approach the shimmering, otherworldly caverns tucked into the hillside. I love hiking and running; there is nothing like being up at 6am, breathing in the intoxicating fragrance of piñon and sagebrush as I run — only in New Mexico! SFF: What are your goals for your business? PB: I’m really jazzed about the way things are unfolding so far! My partner, Jane Anne Thomas, and I have been recently approached with some very exciting opportunities in the world of interior design that we can’t wait to jump into. Prints will always be a big part of what I do, but creating worlds for them to live in is such an innate extension of my creative process that it feels natural to expand in that direction. We are both thrilled to take what we do individually as artists and open the door to redefine the perception of how the spaces we inhabit can function, focus, and elevate our sense of place in the world, personally, intimately, even spiritually. Why limit our definition of art to strictly what we put on the wall, when the space itself can become the art inhabited? You’ve heard me gush about the land, but imagining the ways we can respond to the land here in the way that we live — dialoguing with it intimately through form, design, materials, light ... the possibilities are endless. We cannot wait to see where it leads! One goal we’re keen to manifest together is that we would love to have a showroom in the city proper. The first thing clients ask me is when can they come visit my Santa Fe showroom, and the first thing guests ask me when they enter my home and studio is when will I begin designing spaces. Jane Anne and I look forward to satisfying both requests with a storefront-studio-showroom as soon as the elements align. Seeing my FSE art in the El Rey has been so gratifying; I love knowing that my work is contributing to visitors’ experience of Santa Fe, and I would definitely love to expand the ways I share creatively in contexts like exhibitions, in print, hotels and public spaces. Santa Fe historically offers a deep well of support for people in creative fields, and I sense a unique energy building right now, a palpable feeling that anything is possible, and everyday I am seeing evidence of that! SFF: At the end of the day, why do you do what you do? PB: To be honest, I couldn’t live any other way! I have to make things, and just love working with my hands; to be able to share my creativity with others is such a gift!